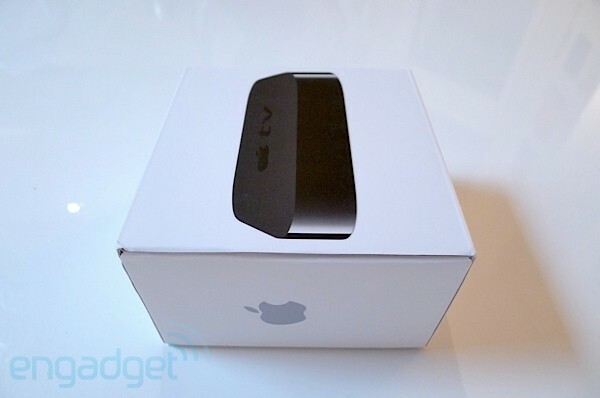 You've been waiting, and it's finally here: the Apple TV review. Months before Steve Jobs announced the new set top box at Apple's annual fall event, we had been reporting on news that the company would strike out again into the TV market, offering a small, low-cost box that had more in common with the iPhone than the iMac. When those rumors came to fruition, we were presented with the completely revamped Apple TV -- a tiny black puck of a device priced at a staggering $99, and centered around a handful of completely new ideas (for the folks in Cupertino at least) about getting content onto your TV screen. The first is a new rental system which allows you to nab brand new TV shows at $0.99 a rental, and HD movies for $4.99 a go (or $3.99 for older titles). And that includes new releases the same day DVDs hit shelves (or Netflix distribution centers). Speaking of Netflix, the new Apple TV also features the rental service's "Watch Instantly" as a wholly integrated component of its offerings, alongside a new function the company calls AirPlay which will allow you to "push" video and audio content from your iPad, iPhone, or iPod touch with the tap of a button. On top of that, the new ATV streamlines sharing from your home computers or laptops, making getting content you own onto your TV dead simple. So, has Apple finally solved the "second box" problem, or are they still struggling to turn this hobby into a real business? 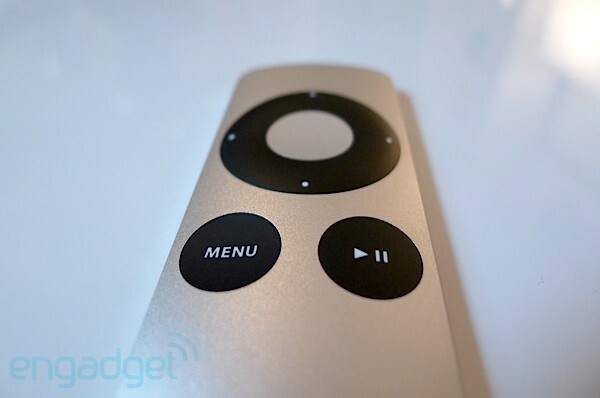 Follow along after the break for those answers (and more) in our full review of the Apple TV! How would you rate the TV 2nd-gen? 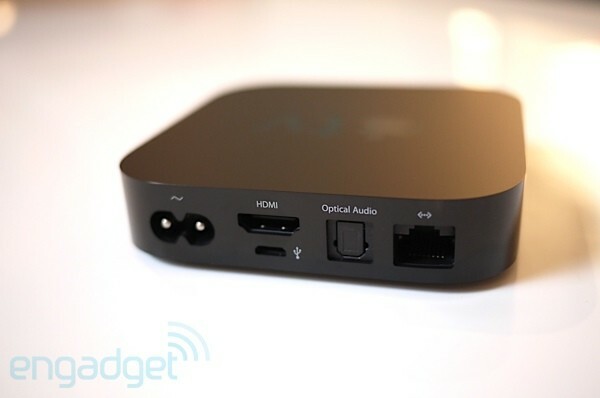 The first thing you'll notice about the Apple TV is just how small it is. The matte black box clocks in at just 3.9 inches square, stands just 0.9 inches off of your table of choice, and weighs a measly 0.6 pounds. It's a quarter of the size of the previous Apple TV -- it's just that tiny. If you're worried about a new piece of gear taking up previous shelf space, the Apple TV certainly skirts that problem. Beyond its size, there's nothing particularly shocking about its appearance -- in most settings the simple box will go unnoticed. Still, like most Apple products, it's an elegantly designed piece of technology that you won't mind having around. Wiring options for the device are minimal to say the least; around back you've got an Ethernet port, micro USB jack (for "service and support" they say), an HDMI port, an optical audio hook-up, and a spot for the power cable. If you're worried about wall warts, you're in luck -- the Apple TV has no need for external power bricks. Inside, the exact specs are unknown, but the ATV is powered by the A4 CPU, the same chip that powers the iPhone 4, iPad, and new iPod touch. Apple isn't fessing up on speed, but it's entirely possible the processor is clocked to 1GHz, like its tablet brethren. As far as memory and any local storage is concerned, however, we'll just have to wait for an iFixit teardown -- though we suspect it won't have more than 512MB of RAM. Apart from the wired internet, the Apple TV also has WiFi (802.11a/b/g/n). In all, it's not a crazy combination, but it's relatively inexpensive hardware, and there's certainly enough power here to handle HD video (of the 720p variety, of course), graphically rich slideshows, and a few other visual perks. The Apple TV comes with an absurdly minimal remote manufactured out of aluminum. The slim accessory is short on buttons (a menu key, play / pause key, and four way rocker with center button), and long on style. We're a little confused about the fact that the remote is silver instead of a matching black, but it's not a big issue. What's more concerning is the fact that getting around the menus and especially entering text is a chore with this remote, though this is also due in part to the way Apple has laid out text. Having to click click click your way to a password, movie title, or email address is pretty time consuming, but we'll have more on that in the software section in a moment. If you're an iPad, iPhone, or iPod touch owner, you have a better option, luckily. The company just issued an update for its Remote app that allows you to control the Apple TV via a touch surface and virtual buttons -- but in this arrangement you get a proper onscreen keyboard as well. This is the way the ATV was meant to be controlled, as far as we're concerned. 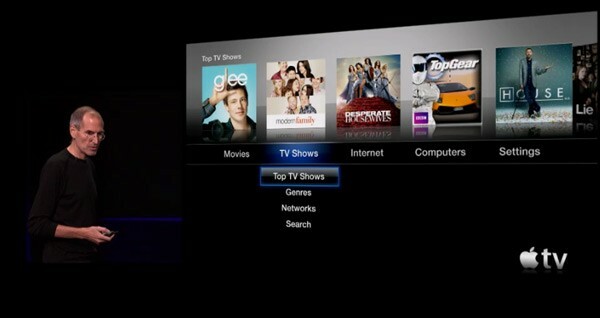 If you're used to using the previous version of the Apple TV, the new interface won't really look all that, well... new. Your main navigation takes place in a menu which shows featured content along the top of the screen, a selection of sources below those, and a list of options for each source. As you venture deeper into the menus, you're presented with fairly standard rows of show or movie selections, or right-anchored lists of text with smaller preview images to the right. Front Row users should also feel right at home. Movie and show pages allow you to preview or purchase content, rate selections, or add items to your wish list (where you can later fish them out for purchase). For films, you can check out Rotten Tomatoes content, something we think is a a really nice inclusion here. All in all, basic control is stupidly easy -- there's almost nothing hidden from view. Setting up the Apple TV was just as stupidly simple, and where a lot of boxes have more complicated code / account syncing, Apple just dials it all in via your iTunes account. When you first switch the box on you're asked for a choice of network and prompted for a password (if you have one) -- as we said before, the one place where the UI stumbles is text entry. For some reason, Apple decided a long list of letters would be easier than a more standard QWERTY-style grouping. It isn't. Traveling from end-to-end with the included remote (with no way to zip quickly down the line) was a painstaking process. Beyond that, you're asked to enter your iTunes account name and password, and if you're a Netflix user, you have to enter that data too. But, surprise surprise -- you don't have to go to the site's activation page to get your account playing nice with the Apple TV. You can also set up multiple laptops or home computers on your home sharing network to stream to the TV, allowing for quick access to video, photos, and music you've got stored on your Mac or PC. After you flip on the appropriate settings (home sharing needs to be active on both your Apple TV and computer), grabbing your stuff remotely is clean and simple. Renting content is as easy as you'd imagine, and Apple gives you 24 hours to watch a movie and 48 hours to watch TV episodes (the timer starts from when you begin viewing; you can hang onto unwatched content for 30 days). One interesting note is that while you can purchase or rent content on your iPad, iPhone, iPod, or computer and then watch it on your Apple TV, you can't do the reverse. So if you rent a movie on your ATV, you're watching it on your ATV, while you can transport a rental on another device around. For those of you trying to catch up on a season of a show by watching whenever possible, this might be a concern. We're guessing most will just opt for the instant gratification of sitting down and picking a flick to view then and there. If you're a Netflix user, you'll find that the interface here is tightly integrated. You can browse your queue, search, add content, and watch video inside the same UI that the rest of the Apple TV sports. There are a few other perks, like YouTube, the ability to flip through photos (which actually is kind of great if you're using the Remote app), and internet radio -- but that's all really a side dish to the main course of pure, top shelf content consumption. So what's missing? Quite a bit actually. In terms of channel selection for TV content, right now Apple is limited to partners ABC, Disney, Fox, and the BBC. The company has alluded to more partners in the offing, but right now the pickings are slim. Okay, but maybe you want to play a bunch of your downloaded or ripped content? Well, it better be an M4V, MP4, or MOV file, because you're not getting anything else onto the Apple TV. AVI, DivX, MKV, and a slew of other popular formats are obviously out -- so you'll have to wait for a decent jailbreak solution if you want to watch those files. And of course, you can't sideload any content or playback from a standalone hard drive. We might be crazy, but an option to connect to something like a Time Machine (or any networked drive) seems like it would be killer in conjunction with the ATV. If you're thinking you can use a network drive that does iTunes sharing, you'll be depressed to know that that won't fly with the Apple TV. You've got to use Home Sharing within iTunes, and that's not possible on third party drives, obviously. It's also a little frustrating that Apple doesn't offer an option to purchase content and leave it in the cloud for streaming. We're sure there are lots of parents who'd like to have their kids' favorite movies on tap whenever they want them without having to crack a laptop or boot up a second machine, and plenty of other consumers want to revisit favorites. Amazon has a better idea with its purchasing options, providing a dedicated basket where you can access the stuff you've paid for from any device you choose (well, almost any device). Why Apple is solely focused on rentals here isn't clear to us -- we see no technical reason the company couldn't provide a "purchased items" location for content you want to own. But those aren't really the most troubling issues we have. The company touts on its website that the Apple TV will have rentals available "often the same day they come out on DVD." In fact, this is one of the company's talking points about advantages of the Apple TV over competitors such as Roku, and Steve Jobs -- when introducing the device -- said that HD movies would be available to rent on the "day and date" of DVD releases. So, you want to watch Iron Man 2 right now? Tough luck -- it's not available to rent on the Apple TV, and won't be for 30 days. And if you were hoping to revisit the original Iron Man, you'll have to buy that title as well, it's been pulled back from rental (to capitalize on the release of the sequel, we'd suspect). If you were thinking there would be special treatment for the Apple TV, think again: studios (and not Apple) will have discretion about what is and isn't made available for rental. That goes for TV too. Even though Modern Family was present in the demo that Jobs did at the fall event, it's not here for rental. If you want to catch up on season 1 of the show, it'll run you $40 to purchase. Season 2? That'll be $52.99. It seems that despite what it sounded like at the launch event, Apple doesn't have a complete handle on its partners, and for the most desirable (or lucrative) content, the studios are most definitely still pulling the strings. If we were conspiracy theorist types, we might even conclude that allowing Jobs to demo Iron Man 2 at the announcement and then pulling the title from rental come launch day was a little twist of the knife. But that's crazy talk. Note: Early in our review period, 'Iron Man 2' was available as a rental, but this was in error and has since been corrected. When streaming 720p content (particularly new movies) the clarity of video was impressive. There was certainly some very minor compression artifacting, but far far less than you would see on HD video on demand from your cable provider, and considerably less than with Amazon's HD streaming. 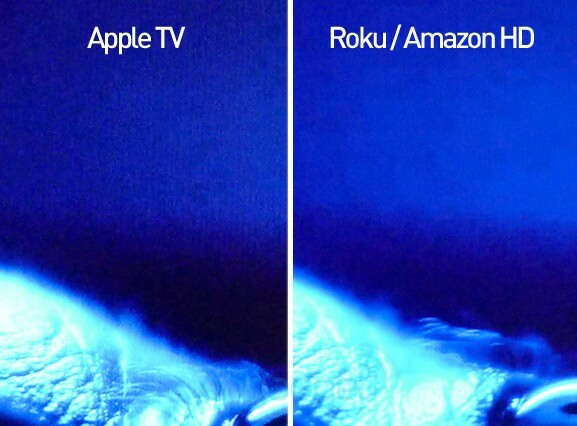 As you can see in the comparison photo, HD content from Amazon on Roku's new XDS looks noticeably more blocky than the cleaner, dithered content coming to Apple's new box. This was true for SD content as well -- across the board, the Apple TV streaming video looked smoother, crisper, and clearer than its nearest competitors. The video quality obviously doesn't match up to the richness of full 1080p Blu-ray discs, but it looks damn good. Sound quality was also superb -- standard stereo was rich and wide, while 5.1 was as crisp and encompassing as you'd expect (though also as you'd expect, not every piece of content you find will have a 5.1 soundtrack to accompany it). Obviously everyone's setup will vary, but in our experience the audio being pumped out of the Apple TV went beyond sufficient. For a $99 box, it's more than pulling its weight in the sound category. 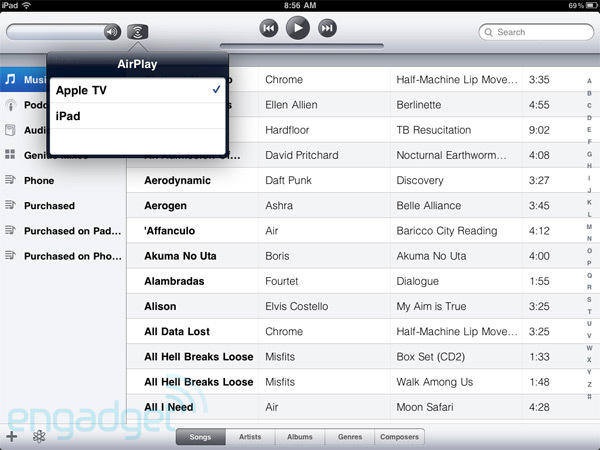 A lot of the team here at Engadget feel like AirPlay could be a game-changing component of the Apple TV. The premise is simple: when using an iPad, iPhone, or iPod touch, AirPlay allows you to move content you're viewing or listening to over to the Apple TV, in realtime. That doesn't just go for videos you've downloaded or music in your iTunes playlists, but streaming content as well. That means that while you're watching a YouTube clip or even an HTML5 Viddler video on Engadget, you can tap the little AirPlay button and send the video to your TV. Unfortunately, AirPlay is only available right now for audio, and won't have its full implementation in place until November. Apple did demo the video pushing feature for us using an iPad, and the system worked flawlessly, save for a tiny lag in between sending the video and it popping up on the Apple TV. There are some lingering questions we have, however. For instance, we were told that while you can multitask on a device you're pushing content from, you can't put it to sleep, even if it's docked or charging. That means the screen will dim, but not shut off entirely, which seems like a weird choice. Hopefully the company will add some kind of charging awareness that allows you to pick some content, dock the device, and sleep the screen. We'll revisit this feature once it's available and give you the Engadget take on its usefulness. As far as using the function for music, it worked without a hitch on our iPad running the iOS 4.2 beta, though there is that slight delay (say, for switching songs). Unlike video, you can sleep the device and have music continue to play, which makes sense given that iDevices also serve as iPods. The Apple TV enters the market amid some pretty interesting competition. Roku has been making big moves in the cheap-and-simple set top category (especially with its new XDS), and the company just announced a partnership with Hulu to allow Hulu Plus users access to the site's content via a channel on Roku (and TiVo) devices. 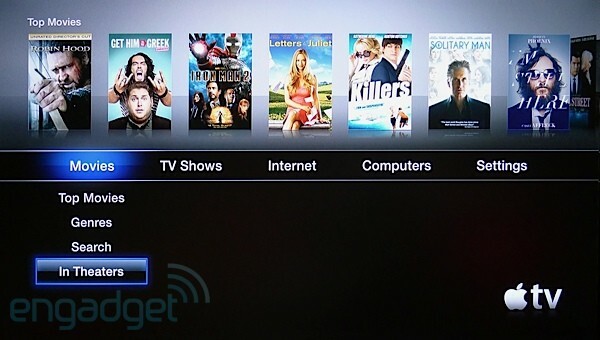 By comparison, the Apple TV offers far fewer options when it comes to channel surfing. Adding insult to injury, shortly after Apple's announcement of the Apple TV and its $0.99 rentals, Amazon announced that it would be making the same batch of TV shows available for purchase at $0.99 (and of course that goes for Roku devices too). That said, the Roku setup process and user interface is far less polished than Apple's offering, HD content doesn't look as crisp to our eyes, and its buffering generally takes longer to get started. It's not just Roku either -- there are options like the Boxee Box in the offing that will bring a slew of new choices to the table, like the ability to play pretty much any kind of content you'd like in one place. But none of the other options we've tested have felt as simple, solid, and easy to use as the new Apple TV. 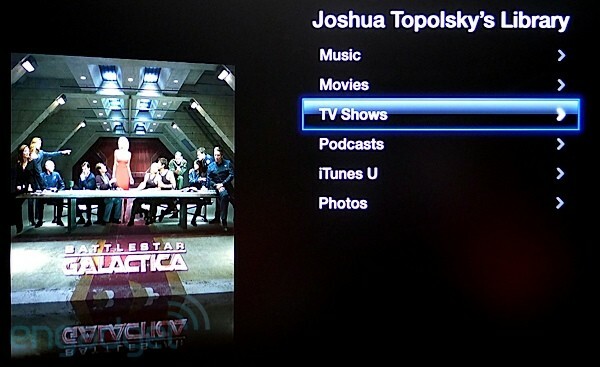 Putting content concerns aside (which admittedly is difficult to do), the Apple TV has a lot going for it. The video and audio quality of the Apple TV is to be lauded, the company is making a lot of high quality titles available right off the bat, sharing from your current computers is a snap, and if you're a Netflix user, the inclusion here is perfectly seamless. The question is ultimately about ease versus options -- right now it's hard to whole-heartedly recommend the Apple TV even at its $99 price point given the thin list of partners Apple has courted. 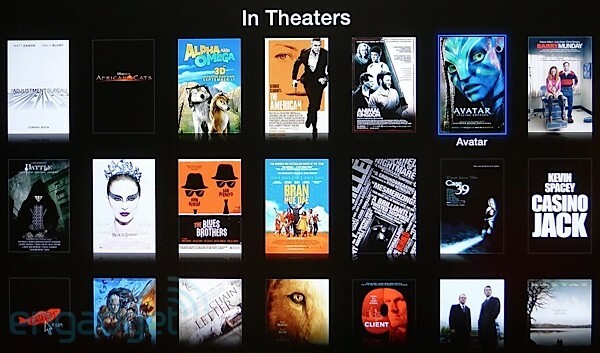 If you just want a dead simple movie rental box and you're not that picky about content, the Apple TV is a no-brainer. If, like us, you're looking for options good enough to make you can the cable, Apple's new box still feels a lot like a hobby.